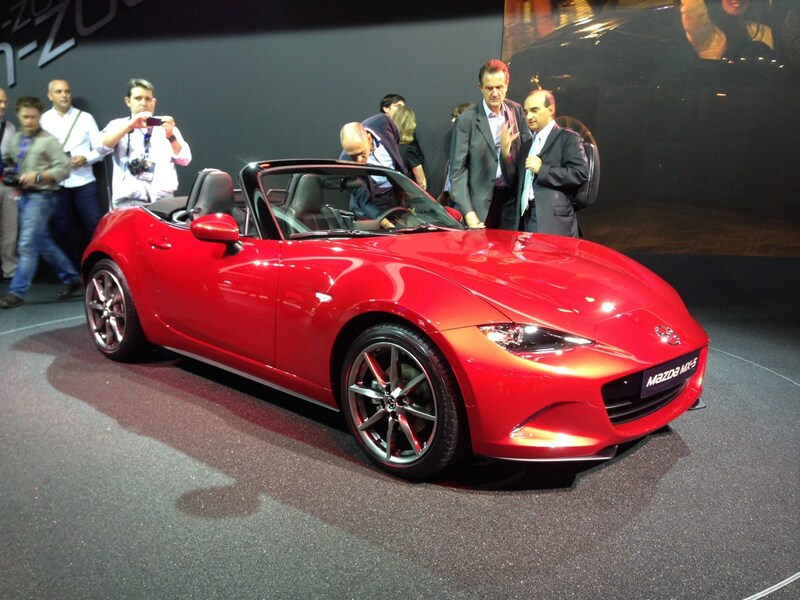 The star of the Mazda stand was the latest incarnation of its ever-popular roadster, the MX-5. Despite having sold almost a million MX-5s without radically changing the styling for 25 years, Mazda has defied convention and the new car showcases an updated look for the sportscar. Styling cues have clearly come from the existing range of new Mazda's, with a beefier version of the standardised grille, swooping lines and recessed headlights. The car will see the return of a folding metal roof, rather than a fabric one, which accounted for the vast majority of the outgoing models' sales. Substance has not been ignored either, with the new MX-5 receiving several performance enhancements to ensure the promise of affordable fun rings true. Handling has always been the MX-5’s strong point, and the new car will be no different. It is shorter, wider and lower than its predecessor. It also weighs 100kg less than the outgoing model, and now has a lower centre of gravity. Biggest news from Paris as far as Mazda is concerned is the new MX-5. Mazda has confirmed at the show today that the MX-5 will be powered by a 1.5-litre ‘Skyactive’ petrol engine, although the company is remaining tight-lipped on power output and emissions figures for the time being. Given that the new car is more than 100kg lighter than its predecessor it’s likely to be a pretty frugal roadster nonetheless. For the first time in the UK, an auto option will be available, alongside a standard six-speed manual gearbox. A larger engine will join the MX-5 range some time after launch, Mazda personnel have hinted. On the show stand, the MX-5 looks less challenging than in pictures and its overall dimensions remain dinky by modern standards. A new multimedia screen sits on top of the dashboard, controlled by a click ‘n’ turn wheel near the gear lever as in the Mazda 3. The new Mazda MX-5 is likely to be launched around June next year. UK spec and pricing is yet to be revealed, but expect prices to start from around £19,000. Alongside the MX-5, Mazda is also exhibiting the 6 saloon, CX-5 4x4 and the medium-sized 3, in both hatchback and fastback (saloon) form. Read more about the new Mazda MX-5 by clicking here.